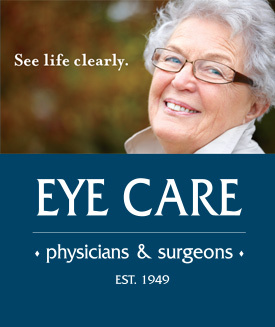 Our parent company, Eye Care Physicians & Surgeons has a longstanding reputation for providing quality care and service to our patients and community. Eye Care offers complete vision care for both medical and optical patients using state-­of­-the-­art equipment, techniques and clinical procedures. Our highly qualified team of physicians, optometrists and opticians offer their expertise in order for you and your family to see life clearly. Whether you require regular eye exams, contact lenses, eyeglasses, LASIK, cataract, or oculoplastic surgery, one of our highly qualified physicians will provide complete vision care for you and your family. We work with people of all ages, adults and children. To find out more please check out the Eye Care website here.